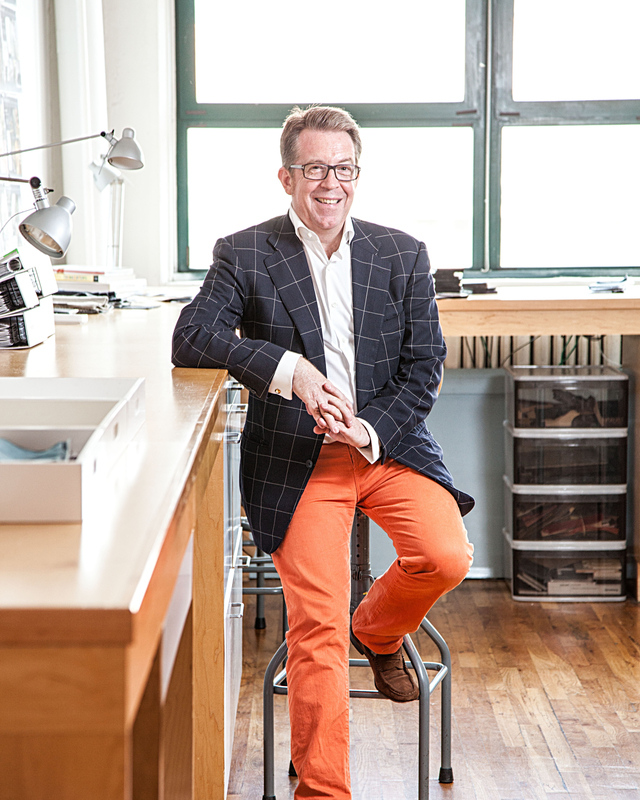 Frederick Wildfoerster (FW): It was a combination of experiences—I was very fortunate to have known influential interior designers and their clients when I was quite young. They were all great professionals but none of them had a firm grasp of what was possible to achieve in a NY apartment or townhouse due to our unique coop rules and DOB issues. These were significant even in the 1970s and have only gotten worse with time. The Italian designers especially were completely flummoxed. I decided to begin my design career as a contractor/designer to learn the ins and out of the business. HTI; Who have been the strongest influences on your career and why? FW: I was (and remain) very influenced by the pioneers of interior design—Edith Wharton, Odgen Codman and Elsie de Wolfe. Having lived in an Odgen Codman designed residence, I experienced his mastery of proportion and scale. On a different level I found inspiration in the works and the great choreographer George Balanchine. I especially admired the way he worked—he had no preconceived plans for the ballet he was working on before he walked into the rehearsal room and saw the dancers. The dancers and the music were his inspiration. That’s how I prefer to work—my inspiration is drawn from the clients and their space. FW: I would remind my young self that: “Dans la vie tout s’arrange” and not to worry so much. FW: My father was an architect and studied with Walter Gropius. He often took me to his job sites and we traveled together to look at significant architectural masterpiece all over the country. I divide my time between New York, Hudson NY, and Italy. FW: I spend time in both but for work I prefer the city. HTI: What is the best advice you have received? FW: Elsie de Wolfe’s three magic words: “Simplicity, suitability and proportion” has stayed in forefront of my mind from the beginning of my career. It applies to all aspects of life. FW: I think sincerity and discipline are the hallmarks of all great products. A dedication to the highest quality should be the goal regardless of budgetary concerns—too much money can be as constraining as too little. Great products are the embodiment of clarity, economy and elegance. HTI: Can you tell us about some of your recent projects? FW: I recently completed a full townhouse renovation—I demolished the interior to the brick and redesigned it. I added a fifth floor, since the owner needed a gym, and a roof garden. It was a great opportunity to create a home for a young family of means with a significant budget. I was also given the mandate of the interior decoration, which is my preferred way of working. I manage the projects, supply all the labor and material, source the products, and make sure my design intent is followed throughout. This way there is an unseen hand, as it were, guiding the project and visible upon completion. Another project—on the opposite budgetary scale—is for a young couple who bought their first home together in Brooklyn. We began with a very detailed and elaborate scope of work (Gracie paper, marble bathrooms, new kitchen etc.) which reflected what their fantasy home would consist of. Although the final budget did not match the fantasy, I was able to switch materials and allocate resources in a way that gave the clients the look and feel they wanted but within their means. HTI: In what ways has the execution of Interior Design changed over the years? FW: I have had to be more diligent to keep abreast of DOB (Department of Buildings) and coop Board requirements, they are constantly changing. The internet has robbed people of the ability to use their imagination so I find I have to be more explanatory when it comes to material and colors. Explaining to clients that buying items like appliances or plumbing fixtures online never works out. I insist that everything be purchased through my suppliers—using my discounts of course. HTI: What have you owned forever? HTI: What do you miss? FW: I had a wonderful friend—Camilla McGrath, a great Italian lady—who lived in a Renaissance villa outside of Lucca, a palace in Rome, and in a large apartment opposite Carnegie Hall. She had been a friend of Cy Twombly and had two huge canvases of his in her dining room. We would talk for hours and hours about everything under the sun—she knew everyone. Before she died–ten years ago now–she gave me her address book. I miss her every day. It was wonderful to experience great art in a private setting—where it was meant to be seen. FW: Can I pick two things? I have a pair of small Sevres vases that are perfect. The colors, the bronze mounts, the spirit of the objects is timeless. The other is the famous Tara Dornbracht kitchen faucet with side spray. It’s exactly what a kitchen faucet should be. FW: I think a room that expresses the personality of its occupants, sings. It’s intangible really—but you know it when you see it. When I saw Mrs. Paul Mellon’s furniture exhibition for the auction a Sotheby’s I heard her voice very clearly. Her unique approach changed how I work. She wasn’t concerned about controlling the movement of the spectator’s eye—contrary to Mrs. Vreeland’s famous dictum. Instead Mrs. Mellon allowed the eye to wander and see what it was interested in seeing, not what a designer imposed on it. A radical departure but I found it liberating. HTI: Who are your cultural favorites? FW: I love to work so I work all the time. If I’m not working I could be at the opera or ballet, playing the piano or cooking. I also enjoy doing research in the Avery Library at Columbia which holds Ogden Codman’s papers. FW: The fewer the people, the greater the organization. I’m an Occam’s Razor adherent. HTI: Perhaps this is why you’ve joined The Home Trust. FW: Your philosophy resonates with me. FW: I’ve reached the point in my life where I don’t believe in wishes but if I must answer I would wish that my Italian friend had been given a few more years to live. Even though I had known her for 35 years there were still things she could have taught me. HTI: If you weren’t in design, what would you be doing? FW: I would be an opera director—which I was for a few years at la Scala and other Italian houses many years ago. HTI: As a genuine industry tastemaker and leader, can you share any insights to your immense success? FW: A successful project is the result of a successful relationship between the client and me. My largest and most satisfying projects were signed after one meeting and sealed with a handshake. If the client feels comfortable and trusts me; the process and the rest will follow. An esteemed colleague—who was associated for many years with Parrish/Hadley—once told me that his most important clients never asked to see his previous projects or to speak to previous clients because they were only interested in what he was going to do for them and had complete confidence in him. HTI: A beautiful story and wonderful lesson. Frederick, thank you for taking your time today. “My father was an architect who studied under Walter Gropius. He took me to job sites and to visit architecturally important historic and modern buildings. After school I set out for Europe, where I assisted the legendary ballerina Carla Fracci in the decoration of her homes in Milan, Florence and Venice. There I was mentored by a group of Italian connoisseurs who collected deliberately and with pleasure, building on inherited family treasures. I have lived in a number of iconic residences; an 18th century farm house, an Ogden Codman ballroom, and an elegant apartment in The Apthorp in Manhattan, not to mention Stendhal’s apartment in Milan, the Palazzo Mocenigo in Venice, and the Palazzo Pecci Blunt in Rome. They continue to inspire me.